When Brooklynite Seth (Zach Gilford, Friday Night Lights) takes his girlfriend Andie (Jena Malone, INTO THE WILD, THE HUNGER GAMES: CATCHING FIRE) to his family’s weekend house in upstate New York for a romantic getaway, they are unexpectedly joined by his estranged father Gil (John Slattery, Mad Men), and his much-younger new girlfriend, Vicky (Gabrielle Union, 10 THINGS I HATE ABOUT YOU). The women carefully negotiate emotional minefields as they persuade father and son to share the house for the first time since the summer vacations of Seth’s childhood. This unexpected family reunion in the great outdoors, fraught with tensions old and new, pushes them all to realize the bonds of family are always stronger and stranger than expected. 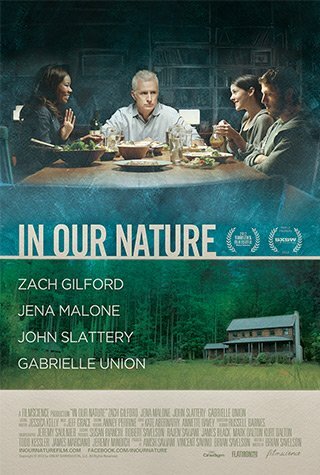 From the producers of MEEK’S CUTOFF and WENDY AND LUCY, IN OUR NATURE is a candid, delicately observed family portrait of couples at a crossroads.